Hip hip hooray! It's time for a giveaway!!! I made it to 35! And to 100 posts! I can't believe it took me over a year of blogging to finally reach this milestone. To celebrate I am having a giveaway! In the spirit of all the "Spring Cleaning" I have been doing around here, and in the spirit of "Spring" herself, I am giving away two wonderful crafty books. 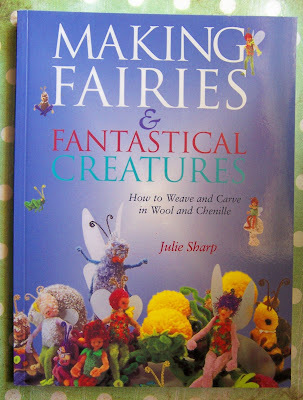 For my Fairy loving friends, the first is.... Making Fairies and Fantastical Creatures, How to Weave and Carve in Wool and Chenille by Julie Sharp. 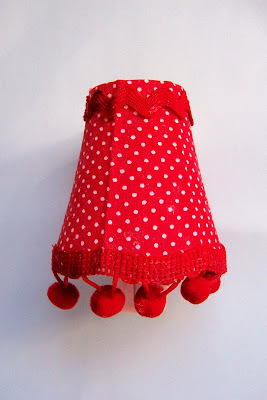 This book has all sorts of cute projects that can be adapted for any age or skill level. Just perfect in time for Spring! 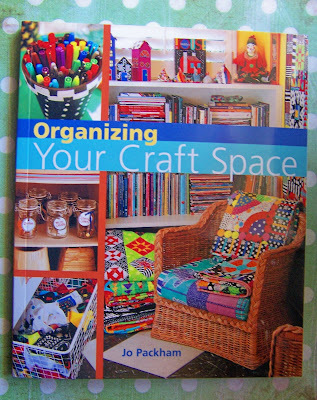 The second is the wonderfully informative Organizing Your Craft Space By Jo Packham. I poured over this book while planning my craft room and it provided so much inspiration as I looked through each page of artistically organized studios. I will also include a crafty little handmade bookmark made from my vintage card stash. Both of these books are sure to inspire! Wanna win em? Just leave a comment on this post and I'll draw the winner on May 8 (sorry for the delay guys..sometimes life gets in the way of blogging!). I should be recovered from all of my cake eating by then! And the return of LOST tonight!!!!Woooohooo!!!! I love the way a soft little night light greets you when you walk into a darkened room. I think this must go back to childhood when the glow of a night light was weapon enough against the imaginary monsters crouching under our beds and hidden in our closets. 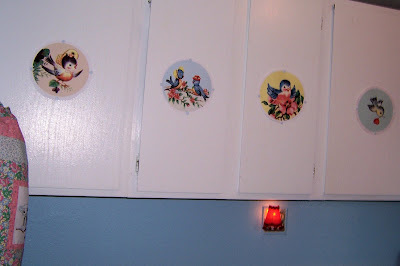 In the midst of our recent home renovating, de-cluttering, cleaning, and decorating madness, I decided to add a few little night lights here and there, but didn't like the choices available at the local hardware store. 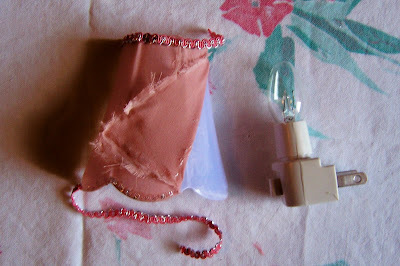 So, crafty me set out to make my own little kitschy one in this night light makeover project. 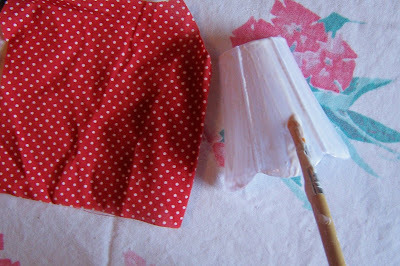 The plastic shade snaps right off of the light bit, making it easy to deconstruct the shade. The old fabric peeled off pretty easily, although I am sure it would have been even easier had I soaked it in a little warm water first. 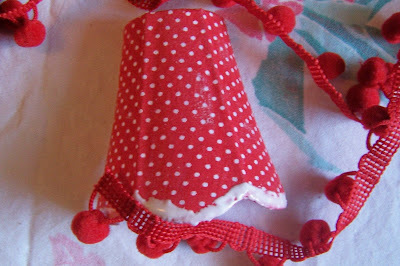 I then liberally applied Aleene's tacky glue with an old paint brush, completely covering the plastic shade so that the fabric would attach uniformly. 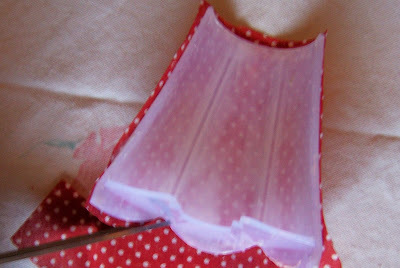 I then smoothed the fabric across the shade adhering it to the glue. Once it had a chance to dry, I trimmed the fabric leaving a 1/8 inch margin to neatly fold the excess to the back as seen below. I had so much fun with this project that I made two of them. All in all, I think I spent about $3.50 for each completed project. 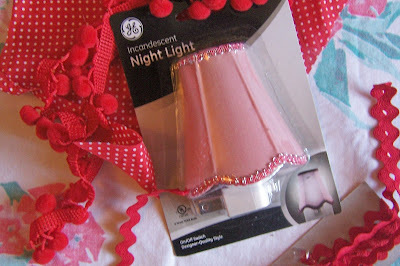 If you want to create your own little night light lampshade, but can't find this type of night light with the pre-made plastic cover, there are some great tutorials here and here for how to make them using standard night lights and plastic cups. Cute!!!! I'll be back on Thursday with my Birthday and 100 Post (whew! took me long enough, eh?) Giveaway!!! Whew!! We have really been on a roll around here! Last week, the garage was cleaned out and reorganized, and we had a little yard sale ( I kept some cute stuff behind to share with my blog friends for a Flea Market Friday sometime in May). 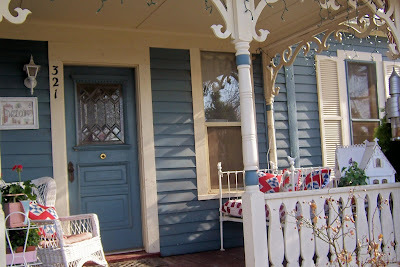 We finally did our taxes (at the last minute) and took care of some other little clutter 'hot-spots" 'round the house. 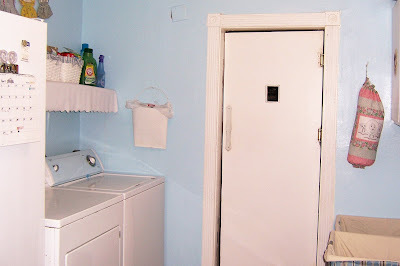 Below are some pics of the laundry/mudroom. It still needs a few things, mainly a bench with cubbies for winter gloves and scarfs, but I am happy with it for now. I am not brave enough to show the before pics, suffice it to say, it was really, really messy! I had been holding on to these sweet little 1930's dresses that I found in an antique shop in a the tiny town on Snowflake, Arizona a few years ago. I love the sense of nostalgia they add here, it's the first thing I see when walk into the room from the kitchen. The ironing board cover is new, from Target. 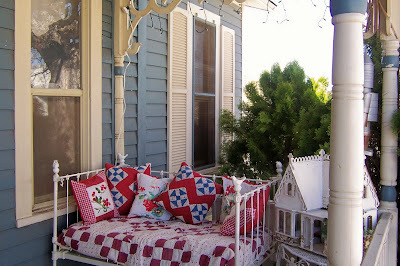 I'd love to have a Cath Kidston one like this.... I am saving up for it! The swinging door, as legend has it, used to hang in an old Hollywood restaurant (or was it a hotel?) that the dashing Humphrey Bogart frequented. Or, at least that's what we were told ;-). Our tiny kitchen (another recently cleaned up space) is on the other side of that door. The tin bucket hanging on the wall was a thrift shop find, perfect for tossing dryer lint and other laundry trash. These cabinets were a depressing, muddy brown. I painted them a glossy white and tacked up these cute blue bird images, obtained from this Etsy seller. The glowing red night light was a small project I finished yesterday. I will post about that tommorrow (promise!). 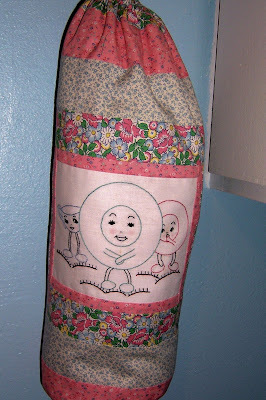 I adore this grocery bag stasher, handmade by the awesome MissesKwitty's! This was my very first Etsy purchase! The baskets shown above were the family member's Easter baskets. 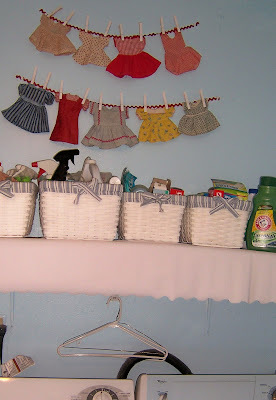 I purchased them knowing that once the Easter goodies were gone, I would be using them in my laundry room project. They are just the right size for organizing the cleaning supplies. And now I know where it all is so that I can stop buying duplicates! 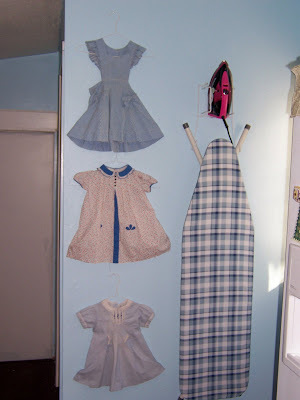 The final finishing touch in this room are the cute little vintage doll dresses, displayed "drying line" style here above the washer and dryer. 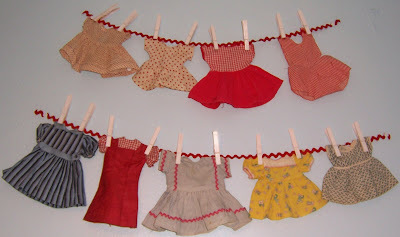 Who says that laundry can't be fun?!!! It's funny a how addicting organization and "Spring Cleaning "can be once you get started. I did take a little time out yesterday to do some crafting (but I made a coupon organizer with that time, LOL!). Being a naturally messy person, I have found lots of inspiration and guidance here... I am slowly working my way around the house and am determined to clear the clutter this Spring! I'll be back tommorrow with my night light project! Oh how I wish I could really have you join me on my freshly redecorated front porch for a sip of lemonade or some sweet tea. The weather is really lovely today.In fact,I typing this on my lap top while lounging on the antique iron crib pictured below. 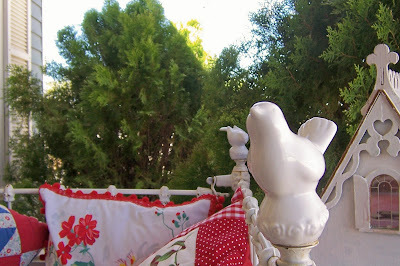 I found that old gem in the yard of a cool little antique shop,not far from Sedona. It seemed to be missing something..so after a little thought,I grabbed these seldom used dove-like salt and pepper shakers from the kitchen,got out the mighty gorilla glue, and viola... birdy finials! Now all I need is my record player and a stack of old 78's (Ink Spots and Glenn Miller of course), and I'll be set for the next 6 months!!!! I've been chipping away at that list! I am actually excited to show you my laundry room makeover next! Check back in a couple of days to see more progress. Hope everyone is having a gorgeous weekend!!! I have been seeing this quiz on other people's blogs. Being the consummate Austen fan, I thought I must give it a go-go for myself and what do you know... I am Miss Lizzy herself! 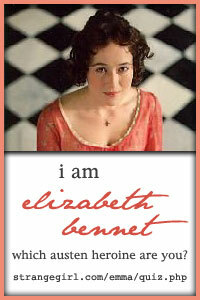 (Although I must say my favorite Austen heroine remains Anne Elliot). Speaking of our beloved miss Austen, have you been watching the PBS/Masterpiece Theater adaptations? They are wonderful! Tonight is Part II of Sense and Sensibility. I am off on a business trip through the end of the week, the culmination of which will be a meeting where I will find out the future of my job's grant status (and therefore, the future of my gainful employment). Okay, I'll admit it.... I still haven't done my taxes. I am a big time procrastinator. This winter, I have let myself and my house get lazy, frumpy and chubby. Therefore!... In this dawn of Spring, and with the 35th birthday looming, I have decided to make my "to do" list public. Hopefully, this technique will inspire me to actually get some of this stuff done!!! This list is just for April, (and it doesn't include my birthday resolution to exercise a little bit more and eat a little bit healthier everyday). Feel free to nag me. I'll be posting pictures of some of the before and after house projects that I accomplish. And you will all be invited to the yard sale (date to be determined)... if there's anything really good for sale, I'll post it here "Flea Market Friday" style before it goes out the door. And best of all, I'll be doing a cool giveaway for my 100th post/35th birthday on April 24th! Woohoo!! !